Why would I need self storage in Whittier, CA? There are a variety of reasons why you might need self-storage in Whittier, CA. How much is a storage unit in Whittier, CA? The cheapest storage unit in Whittier, CA is $62.00 per month. What size storage units do you have available in Whittier, CA? In Whittier, CA we have sizes that range from 4'x5' to 10'x30' to suit your storage needs. How much is it for a 4'x5' storage unit in Whittier, CA? The cheapest 4'x5' storage unit in Whittier, CA is $76.00 per month. Situated in Southern California, Whittier is a growing city that offers a desirable location and plenty of amenities. The city was incorporated in 1898 and began to grow rapidly in the 1950s, thanks to a large-scale housing shortage in the surrounding areas. Modern-day Whittier is celebrated for welcoming neighborhoods, green streets and top-rated schools. It's also a family-friendly city with hundreds of acres of playgrounds, nearly 2,000 miles of hiking and biking trails and a large number of parks. Home to numerous festivals and annual events, Whittier also has a vibrant city center. Just 12 miles from Los Angeles, Whittier boasts a pleasant, small-town feel with easy access to a major metropolitan area. Although Whittier is fairly small at just over 15 square miles, there's plenty to do and see within its city limits. Penn Park is one of the community's largest parks, featuring a scenic waterfall and several hiking trails. Several other local parks include children's playgrounds, picnic areas and walking paths. The city is also home to several state and national historic landmarks, each one with a unique story and history. You can visit the home of the last Mexican governor of the area before it was claimed by the United States, or see the old Southern Pacific Railroad Depot. The Hoover Hotel was the city's most prestigious hotel in the 1930s, and is now an award-winning senior citizens home. Just outside the city limits you'll find Rose Hills Memorial Park, one of the largest cemeteries in the entire world. As you're exploring Whittier, you might feel as if you recognize some corners of the city. That may be because Whittier has long been a popular filming location for many Hollywood films and television shows. Some of he various movies and television shows filmed in and around Whittier include "Hocus Pocus," Back to the Future," "The Wonder Years," "Father of the Bride Part II," "True Blood" and "Masters of the Universe." Whittier's largest employers fall in the health care, education and government sectors. Health care organizations IHC CorP., Whittier Medical Center and Bright Health Physicians provide a large number of health care jobs in the city. Together, the Whittier Union High School District and Whittier City School District also supply many jobs in Whittier. 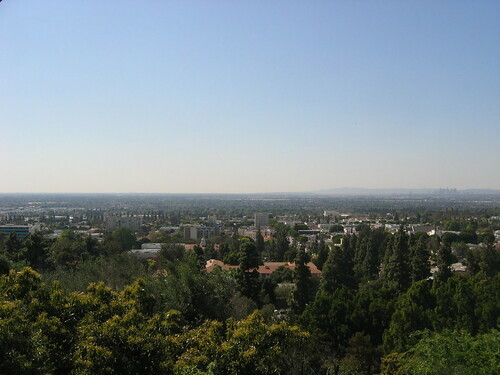 The greater Whittier metropolitan area is home to a wide range of thriving industries. Professional and business services, leisure and hospitality, trade and transportation, and education and health services rank as the largest. If you're planning to look for a job in the area, you might want to check out businesses in the fast-growing industries of leisure and hospitality, construction, and education and health services. Whittier students in kindergarten through eighth grade attend schools in the Whittier City School District, while the Whittier Union High School District serves secondary students. There are also a handful of private schools in Whittier, most of which are operated by the Roman Catholic Archdiocese of Los Angeles. If a college degree is on your list of personal or professional goals, you can attend the historic Whittier College, the Southern California University of Health Sciences or the nearby Rio Hondo College. Utilities: Southern California Edison and Southern California Gas supply electricity and natural gas. A few different companies and boards manage the residential water system, including the Whittier Water Department. Garbage and Recycling: You can expect regular weekly collection of trash and recyclables throughout the residential areas of Whittier. Transportation: There are a number of public bus routes in and around the city, including those managed by Foothill Transit, L.A. Metro, Norwalk Transit and the Montebello Bus Lines. Whittier is bisected by Whittier Boulevard, where higher-density housing is most commonly found. Quieter residential areas with views of the Arroyo Pescadero Trail and other nearby parks are clustered on the western side of the city. The median home value in Whittier is well-above national averages, following closely behind averages for the Southern California region. Apartments are also fairly expensive, though older communities do offer slightly more affordable rent prices. Our lowest priced units in Whittier, CA average $76.43 per month. 272 people have reserved units in Whittier, CA in the past 30 days. There are 7 locations within Whittier, CA's city limits.